When Rolex first introduced the Yacht-Master II during the Basel fair, earler this year, it wasn’t exactly received well by the crowd. Including myself. 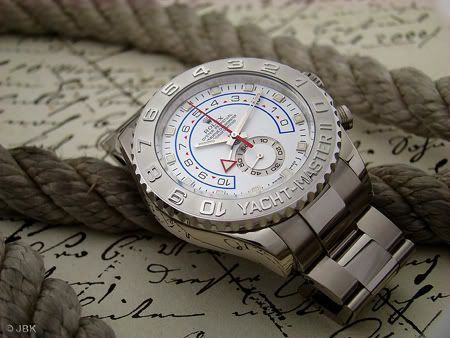 However, Yacht-Master II related messages are currently popping-up on Rolex forums quite frequently. People who have seen the watch in the flesh seem to be less negative than when the news arrived via pictures in magazines and on the internet. Frequent visitor of the German Rolex Forum (www.r-l-x.de) Hannes posted a few impressive pictures of this king size white gold wrist watch. Picture taken by Hannes / JBK. On the TimeZone forum, visitor ‘Otto’ tried on the white gold Yacht-Master II as well and was at least impressed by the watch. However, the price tag on this watch (about 28.000 Euro) is also opening doors to a complicated Patek Philippe for example. You can read about Otto’s experiences by clicking here. p.s. A watch instruction booklet on how the count down feature works, can be found here. It is in German though, but contains a number of illustrations.